Oct. 15, 2018, 10 a.m.
Bots don’t actually write Olive Garden commercials, folks — at least not yet. But they can get trapped in an infinite loop of screaming and self-care. Two-thirds of Americans have heard of social media bots. (Good!) Eighty percent of those say bots are mostly used with bad intentions, compared to 17 percent saying they’re used for good, according to a Pew Research Center survey out today. (Meh.) The survey was conducted among 4,581 respondents in the end of July and August, after those bot Tweets blew up. But there’s obviously a more serious side to this as well — when you have foreign (or domestic!) actors using bots to spray dis- and misinformation into the U.S.’s (or any country’s) social sphere, residents are at greater risk of not recognizing what a bot is and blindly believing what a “bot” puts out. 47 percent of those who have heard about bots say they’re at least somewhat confident they can recognize bots on social media — but only seven percent of that are “very confident.” On the other side, 15 percent say they’re not equipped at all to distinguish the bots. Pew points out that in an earlier study, 84 percent of Americans said they were confident in their ability to recognize fabricated news stories. Unsurprisingly, this can be broken down by age: Around 60 percent of Americans age 18-29 who have heard of bots are at least somewhat confident in their ability to distinguish, compared to less than 30 percent or so for older adults. And, just as Americans are concerned about bots generally, many in the public perceive bots’ involvement in the news to be negative, at least when it comes to how well-informed the public is about the news. 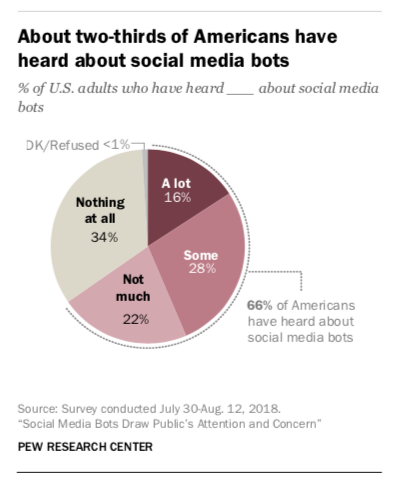 About two-thirds of those who have heard about social media bots (66%) say that these accounts have a mostly negative effect on how well-informed Americans are about events and issues in the news. In contrast, only 11% believe bots have a mostly positive effect, and about two-in-ten (21%) say they do not have much of an effect. What’s more, those who think bots are responsible for a sizable portion of the news on social media are also more likely to think bots have a negative impact on keeping the public informed. Among those who say at least a fair amount of news on social media comes from bots, about seven-in-ten (72%) say that bots negatively impact how well-informed Americans are about the news, compared with 11% who say bots have a positive impact and 17% who say they have no impact. There are some majority-acceptable uses of bots, though: the government deploying bots for emergency updates, businesses promoting products via bots, and a company answering customers’ questions with bots. The respondents are split 50-49 on news organizations using bots to post headlines and stories. Read the full findings here. Schmidt, Christine. "Two-thirds of Americans have heard of bots, but many fewer think they can recognize them on social media." Nieman Journalism Lab. Nieman Foundation for Journalism at Harvard, 15 Oct. 2018. Web. 20 Apr. 2019. Schmidt, Christine. "Two-thirds of Americans have heard of bots, but many fewer think they can recognize them on social media." Nieman Journalism Lab. Last modified October 15, 2018. Accessed April 20, 2019. https://www.niemanlab.org/2018/10/two-thirds-of-americans-have-heard-of-bots-but-many-fewer-think-they-can-recognize-them-on-social-media/.